An Escaped Convict Captured - A Woman Counterfeiter Sentenced. Newark, O., 23 - Lieut. Griffith, accompanied by Officer Elwarner, of Cleveland, arrested one Gus Clemmons, who is wanted in Cleveland for embezzlement to the amount of $300. Both left on the noon train for the above mentioned place. - General Weaver talked greenbacks to the people of Ashtabula Saturday. - Friday. Burglars. J. W. Shaw's house. $150 and a gold watch. Got away. - Farmers complain of a scarcity of hired help. - Wheat much injured by the recent storm and heavy rain in Eastern Ohio. Much of it was beaten down and covered with mud. - All the people employed in any capacity by the Akron Beacon had a reunion Saturday. There was a banquet and speeches. - Tommy Slade, an eight year old boy of Springfield, fell from a brick kiln Friday and broke some ribs. - Mr. Gerry, of Ashtabula, has but one thumb. A buzz saw took the other off Saturday. - Edward Fancher, a young man of Warren, died Saturday of a malarial fever contracted in Kansas. - C. P. Davis, editor of the Auglaize county Democrat, is near to death. He is afflicted with consumption. - John Schwalm, the Canton man reported to have died from drinking seltzer, did not die from that cause. It was ice water. - Little daughter of Roland Hewitt, Mt. Vernon, kicked by a colt Sunday. Fatally injured. - Ohio State Medical society will convene in Columbus June 14, and remain in session three days. - Deep mutterings of discontent come from all over the state on account of the way the Republican convention met the temperance question. - Dr. J. L. Booth, of Crestline, hit on the head with a club in the hands of some person unknown, Friday night. Doctor stunned but not seriously injured. - Alleged that a secret conference of Stalwarts will shortly be held at Columbus. Supposed that it is the intention to issue some kind of manifesto. - John Hayes, of Marietta, killed his wife some months ago. A jury has just found him guilty of murder in the second degree and John will go to the O. P.
- Attorney General Nash says he does not want to be Chairman of the State Executive Committee this year, but nobody else in the party wants to undertake it. - They tried to enforce the law of St. Stubbs in Canton, but it was n. g. The law wouldn't hold. Legal authority decrees that the state has no power to pass such laws. - There are some Greenbackers in Akron. They met Saturday and appointed delegates to the state convention. Some difficulty in finding enough Greenbackers to fill out the delegation. - William D. Corder, of Coffee county, Tennessee, wants to come to Ohio and practice medicine. He writes to that effect to Governor Foster. His specialty is hog cholera. - Gustavus Krebs, of Sandusky, broke open Casper Martin's trunk and took $15 therefrom. Then he went away and became a sailor on the lakes. - Alleged that Governor Foster has received a letter from a party styling himself a "Democratic wheelhorse," and saying he intends to vote for Charley. Probably a myth. Possibly Flopper Fanning or Denny Lawler. - One year ago William Kelly, of Liberty lost a good barn with eight hundred bushel wheat and other grain. He had built a new one on the same site which was about ready for the present harvest and the lightning struck it on Tuesday of last week. - Mrs. Dorety and her daughter, Mrs. Corzillius, of London, Ohio, who were under arrest charged with killing Samuel Armstrong, have been discharged, no indictment having been found by the grand jury. - David Southward, a forger, and James Hamil, a horse thief were confined in the Youngstown jail. They are not there now. They did not like the sort of a jail they have in Youngstown, and so left. They cut a panel out of the door. The Sheriff is looking for them. - C. H. Stone, Chief Engineer of the revenue cutter Commodore Perry, died quite suddenly at 4 o'clock Sunday morning, at Toledo, after an illness of but a few hours. The deceased was 40 years of age and had been in the government service about twenty-five years. He had a wife and child in Philadelphia, who were telegraphed to. His remains were taken charge of by the Toledo Commandery Knights Templar and forwarded to Philadelphia. The "sugar of milk" factory of Dr. L. H. Witte, formerly located at Straight's Hudson cheese factory, but last year removed to Aurora, will soon be in operation again. The erection of a building 35x100 feet, and four stories high, at Hurd's cheese factory, was commenced Monday, and will be completed this month. We learn it is the intention of Dr. Witte to remove his refinery from Cleveland to Aurora, so that the whole process of manufacture will hereafter be done under one roof. - Woman's Christian Temperance Union concluded its section at Akron Saturday. Did not approve of the alleged temperance plank in the Republican state platform, Resolved that "a more vigorous warfare must be prosecuted against the accursed evil." Following delegates to the National Convention to be held in Washington next October: Mrs. T. E. Monroe, Akron; Miss F. Jennie Duty, Cleveland; Mrs. Dr. Way, Waynesville; Mrs. H. L. Monroe, Xenia; Mrs. Dr. Meeks, Troy; Mrs. B. C. Cooper, Ottawa; Mrs. Hunt, Upper Sandusky; Mrs. George Carpenter, Washington C. H.; Mrs.. Captain Williams, Pomeroy; Mrs. E. J. Thompson, Hillsboro; Mrs. D. N. Murray, Portsmouth; Mrs. Professor J. L. Mills, Marietta; Mrs. William Shields, Newark; Mrs.. Fannie Leiter, Mansfield; Mrs. Dr. Johnson, Massillon; Mrs. L. A. Davis Wellsville; Mrs. Dr. Runyon, Cincinnati. MILLERSBURG, Dec. 28, - Professor W. N. DALGAM, the blind music teacher of this place, was married this evening at 8:30 o'clock, to Miss Elizabeth E. BUTLER, daughter of Joseph BUTLER, proprietor of the Central Hotel. The ceremony was performed by Rev. KIRKPATRICK of the U. P Church at the residence of William CARY, corner of Washington and Perkins streets, in the presence of a select few. Mr. DALGAM has been in our midst for over two years, and his friends are county by scores. Although perfectly blind he goes about our streets, and is at the different residences of his many pupils at the appointed hours, and goes in and out of business houses with apparently as much ease as one that has good eyes. Mr. D. will make Millersburg his future home, and we bespeak for him and his charming bride a long, prosperous and happy life. The election of officers of Killack Lodge No. 81, I. O. O. F., took place last night in their room, and resulted as follows: W. C. REED, V. G.; William BURKLEW, N. G.; F. L. MAURER, recording secretary; H. G. WHITE, permanent secretary; A. S. BAIRD, treasurer; trustees, J. I. SPENCER, Samuel PATRICK, J. STUBER,, J. KING, and C. S. GETZ. The town of Nashville, this county, has been incorporated, and its citizens have just elected the following officers; mayor, P. W. DRAKE; clerk, C. M. EBERLY; treasurer, S. MELOTT; marshal, W. H. DeWITT. Several new cases of malarial fever are reported. The public installation of the new officers recently elected in the Masonic lodge took place last night. Rev. Henry FULTON delivered an interesting address. William UHL jumped from the rapid moving freight train at Killbuck, six miles south of here, last night, and received severe injuries. The Balser school-house, in the east end of our county, was totally destroyed by fire last night, together with all the books and furniture. The loss is $1,500, with no insurance. The cause is not known. Officers Elected by Royal Arch Chapters, G. A. R. Posts, Etc. Special Dispatch to the Leader. MILLERSBURG, December 10 = Millersburg Chapter No. 86, R. A. M., have elcted the following officers for the ensuing year: H. P., A. J. S. STIFFLER; King, A. B. FREY; scribe, H. W. WISE; C. of H., A. B. RUDY; P. S., W. G. RUDY; R. A. C., William BURKLEW; G. M. 3d V., A. C. ADAMS; G. M. 2d V., J. P. UHL; G. M. 1st V., H. NEGELSPECK; secretary, Jacob SCHLUPE; treasurer, C. D. PARKINSON; guard, A. B. ALBERTSON. Pomerene Post, of this place, have elected the following officers: post commander, J. F. HUDSON; sr., vice commander, Simeon CHAPMAN; jr. John FITCH; quartermaster, A. J. STIFFLER; surgeon, Dr. J. G. BRIGHAM; chaplain, A. WAITS; officer of the day, J. W. SNYDER; officer of the guard, M. D. FORD; representatives to the department of the encampment, H. G. WHITE and C. G. GETZ; alternates, J. J. CLEWELL and J. BOWERS; trustees - J. J. SULLIVAN, C. S. GETZ and J. J. CLEWELL. A young boy by the name of John Knott, with a desire for independence, has been missing from his home, No. 12 Bolivar street, since last Monday. He took with him a trunk and $5 belonging to his father. His parents think he makes his headquarters at the Lake Shore freight depot and sleeps there. He is 13 years old, wears a suit of gray clothes and blue felt hat. WASHINGTON, D. C., Nov. 18. [Special] - The following fourth class postmasters for Ohio were appointed today: Henry a. Milner, Williston, Ottawa County; William S. Bright, Clintonville, Franklin county. A defective flue was the cause of a $25 fire at 5:25 p.m. yesterday in a house at No. 36 Sherman street, owned by John Myers. It was fully insured. Sheriff Sawyer received a dispatch yesterday afternoon from Sheriff A. J. Walsh of Beaver Falls, Pa., saying that he was coming on the next train to take charge of Confer & Davison held for murder in the case of Doyle, shot at Beaver Falls Saturday night. Chief of Police White and Sheriff Walsh arrived in this city last evening and will return with their prisoners this afternoon. According to White's version of the affray Confer had recently opened a gambling room in a house which was once occupied by a woman of ill repute and that Doyle and two companions went there last Saturday night under the impression that the woman still lived there. In some manner an alteration ensued and in the melee Doyle was shot. David lived at New Brighton, across the river from Beaver Falls, and sometimes worked in a rolling ill. He May Become an Outlaw. George Hess, 11 years of age, who has relatives living at No. 1515 Madison street, Sandusky was committed to the house of refuge by Judge Kelly at Friday morning's session of the police court on the charge of vagrancy. A month or more ago young Hess was convicted in the police, court of the same charge and committed to the house of refuge. He served his sentence and was discharged several days ago the workhouse authorities turning him adrift without money, friends or home. It is said the lad's father refuses to do anything for him, and Sergeant Eitelman suggests that something be done to prevent the boy from growing up to be an outlaw. John Webb, alias James Nesbitt, the man charged with grand larceny in stealing $32 cash and a watch valued at $15 from Henry Whalen has been indicted by the grand jury. As a consequence it was unnecessary to arraign the accused for preliminary examination in the police court Friday morning and he was turned over to the custody of Sheriff Sawyer. Webb is the man who was captured in Allegheny City and who refused to return to Cleveland with Detective Douglas until requisition papers were obtained. Was Picked Up on Life Raft After Long Exposure. Cleveland, O., Oct. 23. - Captain Walter Grashaw, sole survivor in a crew of twenty-two men of the steamer James B. Colgate, is battling for life in a hospital at Conneaut, Ohio, today, following his rescue Sunday. Captain Grashaw of the Colegate, was picked up in Lake Erie on a life raft by the Marquette and Bessemer car ferry No. 2, after he had been at the mercy of the storm without food or water for thirty-four hours. He lives in Cleveland. The Dreaded Cattle Disease Among the Dairy Cows. CHICAGO, July 29. - Texas fever has made its appearance among the cows near the city limits in a portion of the twenty-eighth ward, this city, and about twenty of them have died from the effects of that disease. Inspectors of the health department have made a post mortem examination in several cases and pronounce the disease true Texan fever. The supposition is that animals contracted it from refuse which dropped from railroad cars in which Texas cattle were being transferred into this city. The officers of the department say that the only means of preventing the disease from spreading to all the cattle in the neighborhood is to shut them up until frost comes next fall. GLASSBORO, N. J., July 29 - Samuel Whitney, head of the firm of Whitney Bros., founders of the great glass manufacturing business here and the town of Glassboro, died at Cape May last night. He was 73 years old. He leaves a vast estate. MARTIN'S FERRY, July 28. - [Special] - Elijah Hoover, of this city was struck by lightning while out hunting this afternoon adn his gun was discharged in his hadn. His clothing was badly torn and his body fearfully burned. He may die. He is 60 years old. BROUGHT HERE FOR BURIAL FROM PEORIA - HE WAS A WELL KNOWN CLEVELANDER. Col. O. C. SCOVILLE of this city died at Peoria, Ill., on Friday at the age of seventy years. Mr. SCOVILLE was taken sick about two months ago. His sister, Mrs. BEEMIS, who lives in the western part of New York, and his daughters, Mrs. CORNING of Peoria and Mrs. GIBSON of Chicago, were called to his bedside. He recovered sufficiently to go to Peoria, and it was believed that the climate of that section would assist in his improvement. His trouble was dropsy and Bright's disease. Philo SCOVILLE, the father of Col. SCOVILLE, was proprietor of the old Franklin hotel, where the boy was born in 1823. He took a whaling trip with Capt. George WOLVERTON in 1840, and engaged in other seafaring work. AT various times he conducted a printing office and a cooper shop, and during the gold excitement went to California. The remains will be brought to this city, and the funeral services will be held at the residence of his son, Charles P. SCOVILLE, No. 464 Russell Avenue, at 3 p.m. Sunday. ONCE MORE. THE EARLY SETTLERS MEET AGAIN WITH THINNED RANKS. Interesting Record of Another Year's History - A Memorable Occasion to Those Who Participated - Officers Elected. Rows of white haired men with that ruggedness of physical appearance that characterizes the faces in the famous painting of "The Waterloo Veterans," flanked by noble looking women, whose sharp faces lacked the bloom of half a century ago, but which still shone bright with the beauty of their strong New England character, gathered in the Army and Navy hall on Monday morning to take part in the fifteenth annual meeting of the Early Settlers' association of Cuyahoga county. The absence of that enthusiastic early settler, Col. Richard C. PARSONS, was in a part substituted by Vice President George F. MARSHALL. On the platform were the venerable Mrs. J. H. HARRIS, Rev. Lathrop COOLEY, Father H. M. ADDISON, H. C. HAWKINS, Solon BURGESS and the members of that venerable quartet, the Arions, without whose presence no Early Settlers meeting would be complete. The Hon. H. J. WILLIAMS called the meeting to order and the Rev. Dr. M. L. BERGER made the opening prayer. The Arions sang "Auld Lang Syne." "Many of those who have so contributed to our pioneer local history as preserved in the 'annals' of the association have gone hence. But history is continuous. When the Indian disappeared, and the bear, the wolf, the deer and the wild turkey were no longer seen on the western reserve; and when the forest was cleared and the cottage took the place of the log cabin and the experience of the pioneer of those days became recorded in the 'annals' of our association, then what? Are the early settlers all gone, and is early settlers' history all written up? No. As early settlers of the next generation come in and take their place. "Our membership increased from year to year, until at our last meeting, with the thirty-six who then joined, there had been enrolled 1,026. Nine have joined since, making our total membership, including those who have passed away, 1,035. Of this number 352 died before our meeting of last year; and since July 22, 1893, as appears from the list following, given by our secretary, Henry C. HAWKINS, we chronicle 46 more- leaving a present membership of 637. At the meeting of the association in the year 1892 the executive committee's report showed that forty-three members of our association had died within the preceding year. At our meeting last year the report showed twenty-eight deaths of members from July 22, 1892, to July 22, 1893. The chair then stated that at a special meeting of the executive committee resolutions in memory of the late Vice President John H. SARGENT had been passed and that Mr. George F. MARSHALL had been unanimously elected to fill the position in the association left vacant by the deceased. On motion of Col. O. J. HODGE the following offiers were elected for the ensuing year: President, Col. R. C. PAQRSONS; vice president, Mrs. J. A. HARRIS and George F. MARSHALL; secretary, H. C. HAWKINS; treasurer, Solon BURGESS; chaplain, Rev. Lewis BURTON; marshall, H. M. ADDISON; executive committee, Hon. A. J. WILLIAMS, R. T. LYON, Darwin ADAMS, George F. MARSHALL, W. S. DODGE, Solon BURGESS, W. S. KERRUISH and Boliver BUTTS. The Rev. Lathrop COOLEY then made a short address in which he gave some interesting incidents of early life in Cleveland. The Arions sang several old-fashioned songs and at noon the members repaired to dinner which was served in the building. It only required a good, old-fashioned luncheon, with plenty of substantials topped off with home made doughnuts and coffee, to put the men in an excellent degree of health and spirits. When the members got back in the hall there was an hour for social conversation and the stories that were told would have made old Peter PARLEY envious of his reputation as a recounter. Father ADDISON glided about as nimbly as a boy in a roller rink distributing circulars of his Fresh Air camp. Mrs. HARRIS compared notes with Judge WHITE, Luther R. PRENTISS, who said he was told that he was born in New Hampshire in 1803, but has his doubts about it, and Mrs. A. H. NORTON, who was born in the same year, were centers of interesting groups of friends. As 2 o'[clock seemed to be a good while in arriving the venerable Jon REEVE moved that hereafter the Early Settlers do business by God's time, as they were brought up under it and did not want any new-fangled ideas now. The motion was carried unanimously. To make the next age better than the last? "You remember that it was only 100 years ago that the reign of terror fell across this country like a great pall, because of the fact that this rebellion was founded in that spirit of Jacobinism that had its rise in teh French revolution. The difference is that today there are five imperial states in this northwest territory where we formerly had a few scattered settlements. "In 1788 Arthur St. Clair had opened this northwest territory. He had called the Indians together to arrange a friendly opening of the land. "I wish I could tell you about these great land companies of that day. We inveigh today against private corporation and trusts and they are baneful, but a hundred years ago these great companies were far worse. Benjamin Franklin saw the future of America in the vast imperial territory of the northwest. George WASHINGTON, with his compass and theodolite, understood the west, but aside from these two men there were very few men who understood the grand future of America. It is wonderful how this great tide of population was dashed against the headlands and swept in the inlets of this great western country until it meets the returning tide from the Pacific. "But the Indian possessed the land then. New Nothing remains to tell of them except the names of our great rivers - the Maumee and the Tuscarawas and Cuyahoga and if you would go down to the Cuyahoga now you would wish the Indians had taken the Cuyahoga with them. But whatever we may say in poetry of the red man the early settler had prose experiences with them that were much more true and just then the poetry. "Ohio ought to be a patriotic state. Why, the first settlers at Marietta contained fifty-eight revolutionary soldiers, with grand old Rufus PUTNAM of Massachusetts at their head. "But I am here to tell you something about the great final struggle. And I want to say something about the army of the United States. One hundred years ago the army of the United States consisted of one regiment under Gen. Josiah HAMAR of Kentucky. In 1792 when HARMAR's had been defeated a resident of Washington gave into the hands of Arthur St. CLAIR, the olive branch and the sword of Bunker Hill, and told him to go out and recover this territory. At old Ft. Recovery he suffered a terrific defeat. Washington filled with rage and grief at first against his general, but, waiting for St. CLAIR, heard the details from him and asked forgiveness for his first misjudgment of his old revolutionary comrade. "Then Anthony WAYNE, the Sheridan of the revolution - 'Mad Anthony,' as the soldiers called him, but a cultivated gentleman - was placed in command. Then this army of 5,000 men, with all its subsistence, felling trees and making its own roads, marched through the wilderness, building its own stockades each night, until they reached Ft. Recovery, and 100 years ago in Preble county, at Ft. Greenville, they joined with the citizen soldiery of Kentucky and Aug. 20, 1794, they fought the battle of Fallen Timber. LITTLE TURTLE, the Indian chief, was defeated and a treaty was formed, the Indians evacuated, and for fifteen years peace followed. So it was that 100 years ago this great triumph of civilization was gained for this great northwest territory." Judge WHITE closed by reading a few verses of an old poem called "On the Banks of Old Maumee," which quite brought down the house. A unanimous vote of thanks was extended to Judge WHITE, and Mr. ISHAM sang "The Beautiful City." Judge S. O. GRISWOLD, formerly of thsi city, but now of Connecticut, followed with a brief address, and the meeting closed by singing "America" and the benediction pronounced by the Rev. Dr. M. L. BERGER. ELYRIA, O., May 23. - This section is being overrun by hoboes. Tuesday night a gang of 21 was arrested by the city police. The crowd had terrorized West Side Citizens. At Berea three tramps attacked and fatally shot a sailor, afterward robbing him of his valuables. After the shooting the three men jumped on a Big Four train going south. Several men were arrested at Sandusky on suspicion of being the murderers. Evidence of Murder is Found. Mrs. McClellan Was Probably Beaten to Death at Conneaut, Ohio. Cleveland, Ohio, June 2. - Mrs. Elanor McClellan was found dead on the lake shore at Conneaut, Ohio last Sunday morning, and it is now believed that she was murdered. Mrs. McClellan, who was about 50 years old, was formerly a school teacher at some place in New York, but had been employed as a domestic in this city for some time. She disappeared a few days ago. Before her body was found at Conneaut she told several persons with whom she came in contact that she had run away from Cleveland to escape her divorced husband. She had evidently been struck on the head with some blunt instrument. The coroner today decided that she had come to her death at the hands of an unknown person. The police are trying to find a clew to the murderer. The engagement of Miss Maude KERUISH and Mr. Morris TOWSON is announced. Col. George WICK of Youngstown and well known in this city, is receiving congratulations on his engagement to Miss Mary HITCHCOCK, also of Youngstown. Mrs. Abbie WRIGHT, daughter of Mr. and Mrs. John PANKHURST, of Franklin avenue, was married in New York on the 9th inst. to (Mr. Thoams HAGER PRATT. Mr. and Mrs. Henry BECKMAN announce the marriage of their daughter, Miss Katherine BECKMAN, to Mr. John P. BREEN at St. Peter's church, Wednesday morning, Jan. 29. Cards have been received in town announcing the wedding of Miss Josephine WINSLOW, daughter of Mrs. Henry C. WINSLOW, to Mr. Clifford Warren SMITH, on Wednesday evening, Feb. 25, 16 Trinity church, Buffalo. Miss WINSLOW is a cousin of Mrs. J. R. CHADWICK and is quite well known here. Miss Irene ROOT of the West Side and Mr. Joseph MATHEWS of Michigan were married at the home of Mr. and Mrs. William HUNT, No. 371 Detroit street, Wednesday evening, Jan. 15. They will be at home to their friends after Jan. 19 at No. 92 Ramsey street. The bridesmaid was Miss Nellie HUNT. Mr. Elmer ROOT was groomsman. Mr. C. D. ROOT gave the bride away. The ceremony was conducted by the Rev. E. S. LEWIS of the Franklin Avenue M. E. church. The wedding march was rendered by Prof. WEIBER. Mrs. E. SEKMAN of Dibble avenue gave a tea Wednesday. Mr. and Mrs. William C. SCOFIELD, of No. 832 Prospect street will give a reception on Tuesday afternoon, Jan. 21. Miss DeKLYN and Miss Lydia DeKLYN will receive on Wednesday from 3 until 6 o'clock at their home on Kinsington street. Mr. and Mrs. Henry P. McINTOSH and Miss McINTOSH will give an "at home" Monday evening, Jan. 20. There will be dancing after 10 o'clock. Miss WHITELAW and Miss WALKER will give a reception on Wednesday afternoon from 4 until 7 o'clock at Miss WHITELAW's residence, No. 1020 Willson avenue. Mrs. Frank ROCKEFELLER of No. 832 Prospect street, assisted by her sister, Miss SCHOFIELD, will give a large reception on Tuesday afternoon, Jan. 21, from 4 until 7 o'clock. Mrs. Arthur Bancroft FOSTER and Mrs. William Joseph AKERS have issued cards for a large reception to be held at the residence of Mrs. FOSTER, No. 568 Cedar avenue, on Thursday afternoon. The only large reception of the week was given Wednesday afternoon by Mrs. William J. McKINNIE and her daughter, Miss MAry McKINNIE, at their home on Prospect street. Assisting in receiving were Mrs. Charles CRAWFORD of Columbus, Mrs. Harry McKINNIE, Miss SHOEMAKER, Mrs. J. J. SULLIVAN, Miss Silma SULLIVAN, Mrs. J. J. ELLSLER, Mrs. John STAMBAUGH of Youngstown, Miss MASON and Miss McKIM. The hours were from 4 until 7. Over 200 guests were present. The rooms were handsomely decorated with roses, white narcissus and yellow jonhuils. Mrs. Edward Nash MORGAN and Mrs. Harry E. GREEN presided at the tea table. Mrs. McKINNIE wore a handsome gown of lettuce green silk with velvet and point lace trimmings. Miss McKINNIE wore white striped silk with pale blue velvet and ribbon trimmings. Mr. and Mrs. D. LENTY of Prospect street sailed on Wednesday for a European tour of several months. Mr. G. A. THOMPSON and Mrs. E. D. STONE, who sailed for Spain early in the month, will go from Genoa to Rome and Naples, returning later by wheel to Paris. Mrs. Charles H. BULKLEY and son, Roy BULKLEY will sail for the Mediterranean on Jan. 28. Mrs. BULKLEY hopes the trip abroad will benefit her son, who is in poor health. Mr. and Mrs. H. D. Coffinberry sail on the 28th for the Mediterranean. Mrs. COFFINBERRY will spend this week with her daughter at Cambridge, Mass., prior to sailing. Mrs. J. H. WADE gives a luncheon on Tuesday, Jan. 21. Mrs. W. R. WARNER gave a dinner of fifteen covers on Wednesday evening. Mrs. William EDWARDS gave a luncheon on Thursday for Mrs. TAINTORof New Hampshire. Mr. McDONALD of the Botonians was entertained at the Tavern club last night by a number of his Cleveland friends. Mr. and Mrs. Henry A. EVERETT gave a dinner and box party at the opera on Thursday evening for Miss Harriette BROWN and Mr. Edward BARTON. Mr. and Mrs. Will HAYES gave a violet dinner of sixteen covers at the Union club on Wednesday Wednesday evening in celebration of their eighty wedding anniversary. Mr. and Mrs. George FORD gave a "Dutch" supper on Saturday evening for Miss Anna ELY, who will enter Miss PEEBLES' school in New York this week. Mr. and Mrs. Richard BACON of No. 40 Hilburn avenue gave a handsome dinner of ten covers on Friday evening. The floral decorations were hyacinths, tulips and lilies. Mrs. H. H. BROWN gave a handsome dinner on Thursday for Miss Helen HICKOX, who leaves next week for New York to reside permanently with her father. Miss MATHEWS of Bolton avenue entertained at luncheon on Thursday for his guests, Miss HOAG of Pittsburg, Miss WEBB of Massillon, and Mr. DELANEY of Baltimore. Members of the Lotus club entertained several of the ladies and gentlemen of the Bostonian company Friday evening after the opera at the club house, No. 293 Euclid avenue. Mrs. Edward Nash MORGAN entertained at luncheon on Wednesday for Miss Cornelia EYAS, the charming young pianist, who assisted at the Orlando HARLEY song recited last Tuesday evening. Mr. and Mrs. Dan R. HANNA gave a handsome dinner on Thursday eening at their home on Lake avenue. The guests were Mr. and Mrs. Robert L. IRLAND, Mr. and Mrs. Coburn HASKELL, Mr. and Mrs. Charles A. OTIS, jr., and Mr. and Mrs. William O. Ivison. Mr. and Mrs. Fred P. ROOT gave a dinner at the Union club on Saturday evening Jan. 11, in celebration of their wooden wedding. Those present were Mr. and Mrs. Dan R. HANNA, Mr. and Mrs. W. C. IVISON, Mr. and Mrs. Charles BRITTON, Mr. and Mrs. Edward MERRITT and Mr. Charles R. BRITTON. Mr. J. W. WALTON gave a stag dinner Thursday evening at his home, No. 2659 Euclid avenue. The guests were Rev. Dr. SPRECHER, President Cady STALEY, Prof. M. M. CURTIS, Messrs. Willard FULLER, C. J. DOCKSTADER, Amos DENISON, J. E. ENSIGN, T. W. HILL and Glen K. SHURTLEFF. An elegant luncheon was given by Mrs. D. P. RHODES of No. 148 Franklin avenue on Thursday in honor of her guest, Mrs. Watson HUBBARD of Sandusky. Artistically decorated china and sparkling crystal, selected by the hostess while in Vienna, set off the table to good advantage. On the pink embroidered center piece was a pink cupid dish, filled with pink roses, Roman hyacinths and maidenhair fern. Other decorations were pink and white carnations and daisies. The confections were pink and white. Those present were Mrs. E. B. HALE, Mrs. ZEIGLER, Mrs. WILLISTON, Mrs. W. CROWL, Mrs. E. SEYMOUR, Mrs. C. A. HATCH, Mrs. C. SELDEN, Mrs. M. RUSSELL, Mrs. M. COFFINBERRY, MRs. R. R> RHODES, Miss Stella HATCH and Mrs. CHAPMAN. IN AND OUT OF TOWN. Mr. and Mrs. W. H. BOARDMAN are in New York. Col. J. J. SULLIVAN returned Wednesday from New York. Miss EDISON of New York is the guest of Miss Georgia SHORT. Mr. Thom BEARD of Chicago called on friends in town last week. Miss JAne BURNETT is entertaining Miss Frances WOODFORD of New York. Miss Ray Tod is visiting her fiance's parents, Mr. and Mrs. BULKLEY, in Brooklyn, N. Y.
Mrs. W. N. CLEVELAND is visiting her son, Mr. C. M. CLEVELAND of Bolton avenue. Miss Daisy GORDON left for New Haven on Saturday to attend the Yale promenade this week. Miss Maud MEECH of Chicago is visiting her cousin, Mrs. Julius B. SAPP of Cedar avenue. Miss Kate MORRIS of New York is the guest of her grandparents, Mr. and Mrs. Dudley BALDWIN. Mrs. P. W. DITTO is spending a few weeks in Brooklyn, N. Y., with her sister, Mrs. W. J. CAUTHERS. Mrs. Truman C. WHITE of Buffalo is the guest of Mr. and Mrs. James M. LEE of No. 839 Prospect street. Mrs. George PRESLEYof Clinton street and Mrs. Ira BASSETT of Franklin court visited in Youngstown this week. Miss Agnes HOWELLS of Harvard street has been the guest of Mrs. E. SICKMAN of Dibble avenue during the past week. Mrs. NEWBURY of Detroit is the guest of her father, Major T. P. HANDY, who celebrated his eighty-ninth birthday on Friday. Mrs. Samuel MATHER and daughter, Miss Constance, Mrs. Charles A. BALDWIN and Mrs. Charles W. BINGHAM are at Palm Beach, Fla.
Miss Florence JONES is in New York for a fortnight's visit with her sister, Miss Jessie JONES, who is studying art at the National academy. Mr. J. Edmund V. COOKE left last night for Chicago, from which city he will make a tour through Illinois, Kansas, Iowa, Nebraska and Missouri. Judge and Mrs. Walter C. ONG returned on Tuesday from Columbus, where they were members of the governor's party at the inauguration ceremonies. Miss Bessie CUNNINGHAM of Sewickly, Pa., is the guest of Mrs. Robert S. PIERCE, who entertained at cards in her honor on Wednesday afternoon. Mr. and Mrs. Frank De Hass ROBISON and the Misses ROBISON have returned from a three weeks' visit to St. Louis and other western cities. They are at The STILLMAN for a brief stay. Mr. and Mrs. John F. WHITELAW and Miss WHITELAW will go to Palm Beach, Fla., early this week. Mr. WHITELAW will return in a few days, leaving his wife and daughter there for the remainder of the winter. Miss WHITELAW is in delicate health and hopes to be benefited by the change. Two Narrow Escapes From Ditching on the P. & W. - Akron's Central Labor Union Elected Officers - Case of Heart Failure. Akron, O., February 4. - At the regular meeting of the Central Labor Union last evening to following officers were electd: President, John A. Wintrode; vice president, Charles Wickline; recording secretary, A. Kaufman; corresponding secretary, George Berg; secreatary-treasurer, P. F. O'Neil sergeant-at-arms, O. Schick. Passenger train No. 6 of the P. & W. which leaves Akron at 1:55 a.m., had two narrow escapes from serious accident yesterday. The engine jumped the track twice, but each time the train stopped before any damage was done. Snow and ice are said to have caused the accidents. Miss My Pierson, of Indianapolis, who is visiting the Misses Coler, of this city, was attacked by heart failure while returning from a sleigh ride to Manchester, ten miles south of this city, last night. She became unconscious when nearing the city, and although medical aid was in attendance as soon as she could be taken to the Coler home, she was still unconscious this afternoon, and it is feared that she cannot recover. Thought He had Not received His Share of Their Father's Estate and Sought Revenge. Suisun, Cal. Feb. 4 - Frank Bellew was arrested on a ranch near Elmira and lodge in the county jail here charged with murdering his brother and sister by poison. Lewis & Susie Bellew were two of the most popular young people in Dixon county and lived together in a cottage on the outskirts of the town. The night before they were poisoned early last November, Frank Bellew ate supper at the house. He was the one person who had access to the water and food. When the victims took sick he was almost the first person to ___ to their house. He helped the ag____ to make gruel, using water from the teakettle he is alleged to have poisoned. The day before the crime Frank Bellew called on his brother-in-law J___ B. Bird, a photographer. He complained to him bitterly, as he had done to others, that he had not received enough of the property of his parents who had overlooked him in their will. He added: "Bird, I'm going to commit a terrible crime tomorrow. I'm going to commit a tragedy that will shock the whole community." After the ___ Bird had reason to believe that Bellew intended to kill him, and made a statement which led to his arrest. Glasgow, Feb. 4, - A mail train and a freight met in collision to-day at the Glasgow & Southwestern Railroad near Troon. The driver and fireman of the freight train and five workman __ were on baord the mail train and killed. In addition thirty-six persons were injured, some of them fatally. Washington, Feb. 4, Senator Walthall, of Mississippi, is recovering from his latest attack of the grip. His condition hias not been regarded as serious by his physician, and his progress towards recovery is deemed satisfactory. Hillsboro, O. - Miss Minnie Riggs is visiting Cincinnat - Mr. Benjamin Thomas and Miss Jennie Lynn were married Tuesday, Sept. 18, by Rev. Simeon White - The Baby of Mr. and Mrs. Bert Woods died Saturday the 22d. - Several of our people attended the . of P. celebration at Washington C. H., on teh 24th. - Mrs. Mary Butler, of Cincinnati visited Mrs. Chas. Donaldson last Sunday. - Messrs. Geo. W. Bolden and David H. Young are better. - Mrs. David Green and Miss Green of Leesburg visited the former's mother, Mrs. Noah Barker on the 22d. - Rev. Simeon W. White attended the Ohio A. M. E. conference at Wilmington. - Chas. Metcalf was injured at Rucker's stone quarry on teh 24th. - Justice L. Williams was married at Bainbridge last week. - Howard Powell has returned from a week's visit to his mother in Lebanon, O.
Rev. D. J. Starr, chaplain of the Ohio penitentiary, who is attending the convention of the Ohio Prison association, was taken ill at 11 o'clock Wednesday morning in his room in the Hollenden hotel. He was removed in Black & Wright's ambulance to the Cleveland General hospital. His condition is said to be serious. Rev. Mr. Starr is seventy-two years old. DETROIT, Mich., May 18 - A Free Press special from Menominee, Mich., says: Ed Boatmann of Marinette, Wisc. and Caroline Garnier, aged sixteen, of this city, were drowned in the river here today by the capsizing of a rowboat. Youngstown Detective Refuses to Help Get Man Out of Workhouse. YOUNGSTOWN, O. - May 17 - An attempt was made to bride Grant S. Ford, a Pennsylvania railroad detective, to get him to secure the release of George Foley, alias Tom Collins, alias "Kid" Loftus, from the Cleveland workhouse. Foley was arrested with six other pickpockets and sentenced to the workhouse for thirty days and fined $50. A letter was received by Mayor Brown from Robert Mack, assistant superintendent of the Cleveland workhouse, asking him to release Foley, whose home is at Allegheny, Pa., because his aged mother was dying. He said that Foley had accidentally fallen into bad company and was not a criminal. Another letter was received today by special delivery from Mack, asking the mayor to hurry up the pardon, as he wanted to take Foley to Pittsburg with him tomorrow. Ford had been offered $150 by Ed Foley to secure the release of his brother, but he refused to do so. Albert G. Riddle, Former Attorney of Cleveland and Once Congressman From This District. CHARDON, O., May 18 - Hon. Albert G. Riddle, who died in Washington last week, though not born in Geauga county, came with his parents to Newburg township from Monson, Mass., when very young, and his boyhood and younger manhood were spent in Geauga county, where he has relatives. He studied law in Burton, with Gov. Seabury Ford, and later was associated in practice with Hon. Alfred Phelps at Chardon, moving to Cleveland in 1850. He married Miss Caroline Avery, daughter of Judge B. F. Avery, and sister of Mr. D. F. Avery of this place, in 1845. He was elected to Congress from the district composed of Geauga, Lake and Cuyahoga counties in 1860, serving, one term. Mr. Riddle was counsel for the defense in the famous "Oberlin Rescue Case," tried in Cleveland, in 1859, in which a number of Oberlin people were tried for having recaptured from a United States marshal and posse a Kentucky slave, whom they had given refuge and sent on to Canada. Mr. Riddle cherished a passionate fondness for the scenes of his youth and until the infirmities of age prevented was an almost yearly visitor to Geauga county, being a familiar figure at the yearly pioneer gatherings at Lake Punderson. He contributed largely to and edited Williams Brothers' history of Lake and Geauga counties. Hospital Fire in Cleveland, Ohio, in Which Four Lives Were Lost. CLEVELAND, O., February 2 - The Deaconess Hospital on Jennings avenue, South Side was destroyed by fire at noon yesterday and four persons are known to have been burned to death. The bodies of a child, two men and one nurse had been recovered at one o'clock. It was not known at that hour whether there were any more bodies in the building and it will not be known until the roll of the saved ones is called. HAS BAD CAREER - HARRY RENOLDS HAS HAD NUMEROUS CASES OF MATRIMONY, IT IS ALLEGED. Something About Life of Man Who Is Believed to Have Deceived Many Women and Secured Their Money - Has Worked in Several Cities - Double Life of Missing Man - Police Search for Deceiver. Nol. 1 - Formerly Miss Lily Cook, married Reynolds in Buffalo in 1884; mother of his four children; living at 62 Northampton street. No. 2 - Miss Besse McKenzie, a saleswoman, married Reynolds in Chicago in 1902; died at Lakeside Hospital April 1, 1904. No. 3 - Miss Mae Smith, aged 21; married Reynolds in Norwalk at 11:30 p.m. Monday; now at her home in Norwalk. No. 4 - ____, mother of the nine year old girl at school in Blairsville, Penn. Cleveland, Ohio, March 13 - Harry Reynolds man of multiple loves and lives, is compared to Johann Hoch, the arch bigamist recently hanged in Chicago by Prosecuting Attorney Wickham, of Huron County, who arrived in Cleveland this afternoon with Sheriff Snyder to begin their quest for the fugitive. said Mr. Wickham. "I shall not be surprised if several other women who supposed themselves his wife are discovered through the publicity now being given the case. The theory that the little girl in Pennsylvania is the daughter of still another bigamous wife I consider quite plausible." The Norwalk officers went to Central Station on arrival and held a conference with Inspector Rowe, asking him formally to detain Reynolds should he return here. Prosecutor Wickham said later that circulars with Reynold's picture, which the police here have, would be sent to police departments thoroughout the country, with a request for his arrest. BYSTANDER KILLED IN BANDIT BATTLE. POLICE AND AUTOMOBILE ROBBERS IN RUNNING FIGHT ON CLEVELAND STREETS. Cleveland, Dec. 1 - In a running street battle today between automobile bandits and the police, Earl Mueller, a bystander, was killed. The bandits escaped. The police believe one of them was badly wounded. Mr. and Mrs. Charles R. Morgan, 1553 E. 55th street, and Dr. and Mrs. J. M. Moore, 10643 St. Clair avenue, are motoring to Marine City, Mich. They will return about Sept. 4. Mrs. H. C. Reymer, 9326 Amesbury avenue N. E. and daughters Florence Edna and Dorothy Virginia, will leave the first of the week to reside in Wilkingburg?, Pa.
Dr. and Mrs. M. H. Morrison and son, 2106 W. 25th street, leave today to spend two weeks at Cambridge Springs, Pennsylvania. Miss Helen M. Bregenzer, 18702 St. Clair avenue N. E., entertained her sister, Mrs. James Rains of Lebanon, Ky, the past week. Mrs. Rains is now at the home of another sister, Mrs. W. H. Baker of Andover. Mrs. Ruby Hanna, 3263 Clarendon road, Cleveland Heights, and Miss Christine Campbell, Hathaway avenue N. E. are spending some time at Nelson Ledges, Portage county. Dr. and Mrs. H. F. Staples, 3054 Somerton road, Cleveland Heights, returned Monday after a month of motoring through Massachusetts and New York. Mrs. D. Cahill, 1414 E. 66th street, and Mrs. Archie Butler, Blythen road, left Wednesday evening to spend a few weeks with friends in the east. Mr. Otto C. Schuler of Denver, Col., is spending the week with his parents, Mr. and Mrs. G. H. Schuler, 3720 Cypress avenue S. W.
Dr. Anna K. Scott formerly a resident of Cleveland, for twenty-five years a medical missionary in China, is spending a few weeks at the Garfield hotel, 3848 Prospect avenue S. E.
Miss M. Deutschman, 8311 Euclid avenue, and Miss E. Goeers of Housh avenue N. E., have left for a lake tour ____ will attend the convention of the Fashion Art League of America in Chicago. Mrs. Adam Ketzell, 1941 E. 66th street has returned from a stay of two months in New Haven, Conn., New York city and the Catskill mountains. State Marshall Issues Warning, Citing Cost of Carelessness. Plain Dealer - Bureau, 22 S. High Street, Columbus, Dec. 20. More than 250 people were burned to death in Ohio in 1919; and more than 400 were injured. According to reports made public today by William J. Leonard, state fire marshal. Of the dead, seventy-four were babies or children and nineteen were aged people. The majority of the children were killed either in the morning when they sought the warm fire in their nighties, or at night when they were ready for the "sand man," says Mr. Leonard. When the mercury drops, the death rate from fire goes up. "Four children left alone when mother went to the grocery or to the neighbors lost their lives, and two were injured. Four aged persons were burned to death while alone in the house. In over 95 per cent, of the total casualties, the element of carelessness entered, the report declares. The causes of the deaths ranged anywhere from suicide, murder and the "going bad" of an airplane engine in mid air, to playing with matches and to the most prolific cause of all - the open fire. "The four man causes of the home tragedies were open, unscreened fires, gasoline, kerosene and oils. _____ and playing with fire and matches. Woman Run Down by Train While on Way to Neighbor's Home. ULRICHSVILLE, O. April 5 - Mrs. Anna Culberson, 48, was killed almost instantly here this morning when she was struck by a Pennsylvania freight train at a grade crossing. Mrs. Culberson, who was going to the home of a neighbor, stepped in the path of train after another freight had passed in the opposite direction. Declares Pittsburg Heir Married Her After Whirlwind Courtship. NEW YORK, April 5. - Three witnesses told a supreme court grand jury today what they knew about charges that Joseph Donald Grafton, son of a wealthy Pittsburg furniture manufacturer, committed bigamy by wedding Peggy Davis, 17, "Follies girl," last December three weeks after he had married Ellen Curley McIntyre of Youngstown, O.
Mrs. McIntyre-Grafton was the first witness. The others were Mrs. Capitola P. Laird, mother of Peggy Davis and Albert A. Shepard, who works on a trade paper. Grafton's marriage to Miss McIntyre the latter told reporters after she appeared before the grand jury occurred despite the objections of her family and followed a whirlwind courtship during which she broke off her engagement to a boyhood chum. While on their honeymoon in Cleveland and New York, the girl declared she wrote her parents and obtained $300 because Grafton said money from his home had been held up as the result of an affair he had with an actress. Mrs. Laird told interviewers that Grafton denied that he had been married to anyone else when he and Peggy were wedded in New York last December. The couple had started housekeeping in Troy, N. Y., she said, when Grafton disappeared. MARRIETTA, O. April 5 - Two veteran steamboat men, Capt. Bradley B. STONE, 80, and Engineer Louis P. DAVIS, 72, are dead here today. Both men had operated boats on the Ohio and Mississippi rivers from Pittsburg to New Orleans. DAVIS wa a brother to Capt. Steve DAVIS, who died a short time ago. Akron, O., Aug. 4 - The delegation of girls which represented all five Akron High schools at the annual high school conference of the Y. W. C. A., at Winona Lake, Ind., this week, will return to Akron Tuesday. Miss Mildred Burns and Miss Grace Dean, teachers, and Miss Ruth Cramer headed the group composed of Misses Margaret Elwarner, Doris Woodward, Elizabeth Thomas Betteridge, Lucille Falor and Eleanor Myers. Caroline GOLENESKI, 18, yesterday identified a youth held on a robbery charge as Joseph PAWLAK, 19, of 7009 Clement avenue S. E., as one of two "gas Hawks" who forced her into an automobile at the point of a revolver on Dec. 15, and attempted to attack her. Police are searching for PAWLAK's companion, who is believed to have been wounded in a gun battle with police Monday night. Blood stains were found in the snow after the battle. "Get into the car, blondie, or we'll kill you and throw you into the guilley," the boys said, according to Caroline. Caroline saw the two enter a store at Chambers avenue S. E. and E. 71st street Monday night. A friend got Patrolman George WICK from a near by theater. The youths got the drop on WICK and took his revolver. More police were summoned, a gun battle ensued, and one youth escaped. Harley PENCE of Fostoria must die in the electric chair at the state penitentiary Jan. 7, unless Gov A. V. DONAHEY grants executive clemency. The state supreme court today refused to hear his appeal. PENCE, last Feb. 12, shot and mortally wounded Mrs. Marjorie BODDY of Columbus, with whom he was boarding. She formerly had lived in Fostoria. The shooting was alleged to have been prompted by jealousy. PENCE is married and has a family in Fostoria. PENCE was found guilty of first degree murder in the Franklin county courts and sentenced to be executed last September. The appeals court in its consideration of the case delayed the execution date to Jan. 7. Electing to sue his employer, the Republic Iron & Steel Co. of Youngstown. Instead of accepting award from the state industrial commission. German GONZALES will receive $20,000 by a ruling of the state supreme court. A jury awarded him the damages and the higher courts affirmed. GONZALES was injured when a steel cabinet fell on him. He sued the company on the ground that it had violated a lawful requirement, relative to providing safe places for its employes to work. The award obtained through court action is much greater than he would have received from the industrial commission. When a man drives his automobile into a moving train at a crossing, the railroad company is not liable for damages, the state supreme court held in effect today in reversing the court of appeals of Lucas county and affirming the common pleas court. Lorus W. HUGHES on a foggy night drove his automobile into a train operated by the Toledo Terminal Co., injuring himself and his machine. The supreme court held HUGHES is not entitled to damages. Steam railroads were victorious in the main in their fight against trucking companies engaging in general freight hauling business on an unrestricted scale in cases decided by the supreme court today. Eleven cases were involved, each being appeals by the railroads from orders of the utilities commission in granting the trucking concerns certificates to operate generally throughout the state. Student Killed as Auto Skids. LAPORTE, Ind., Dec. 28. - (AP) - One student of Taylor university at Upland, near here, lost his life, another probably was fatally injured and four other students hurt when an automobile they were driving from their homes in Iowa to Upland, skidded off the road near Laporte today. A relief client, unable to pay his rent due to lack of county funds, faced a hard choice Tuesday - marriage or eviction. "My landlady said I can stay if I marry her," he told Miss Bell GREVE, county relief director. "But I won't! I'll be evicted first!" CLEVELAND, Ohio, Dec. 4, (AP.) - A far-reaching Ohio Supreme Court decision, holding that the birth of a sixteen months ago to Mr. and Mrs. Marvin Court violated their apartment lease, will be appealed to the United States Supreme Court, Attorney Morris Morganstern said Wednesday night. Morganstern reported he would fly to Washington this week, to file an appeal, nothing that the decision in the state's highest court was split 4 to 3. Mrs. Court was tearful as she learned of the state court's ruling which upheld the right of a landlord to restrict occupancy of his property to adults, and reversed a Cuyahoga County appellate court decision. "I don't know what we are going to do - move out into the street, I suppose," Mrs. Court said. "This ruling was not only important to us but to all other parents who have children and who are at the mercy of landlords. Arrested many times in Ohio, Maryland, South Carolina, Alabama and Texas Fred William POOLE is __reased by the Federal Bureau of Investigation with killing one John KELLY when his victim refused to open a safe in his home. KELLY was shot while on his knees in the room where the same was kept. 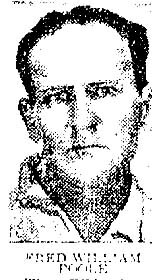 POOLE was first arrested in 1912 and was most recently released from a penitentiary Jan. 23, 1943. The FBI charges him with unlawful flight to avoid prosecution. If you seen this man, notify the FBI.